Celebrating Wales is organised by Asamum over at Asamum Booktopia. Please click here to see other posts connected to today's Welsh celebration. When considering a Welsh author for this post, I found it easy, once I realised Catherine Fisher was Welsh. I read her book The Conjuror's Game when I first started blogging back in 2009. It consisted of three books and I loved everyone of them, so I was more than happy to dive into Incarceron. I have to admit to being a little bit daft when it came to reviewing this book as I hadn't realised it was Steampunk. Asamum kindly informed me, so I thought I had better add that in. My last venture into Steampunk had been so dramatically different that I would never have put the two in the same category. Finn had been flung on his face and chained to the stone slabs of the transit way. His arms, spread wide, were weighted with links so heavy he could barely drag his wrists off the ground. His ankles were tangled in a slithering mass of metal, bolted through a ring in the pavement. He couldn't raise his chest to get enough air. He lay exhausted, the stone icy against his chest. I have to admit to being a little confused when I started reading this book. The first two chapters seemed to be set in completely different settings and eras with no explanation and I found myself rather lost. The second chapter was set in what appeared to be the 17th Century whilst the first chapter felt like a scene from a Dickens novel. It was only when I got to chapter 3 that I seemed to find my feet, becoming aware of a dystopian feel. It gave me the impression that the author had set the story on Earth, yet in some descriptions it felt too far fetched to be Earth and was more likely to be a fantasy world. I felt I had to make this clear, because I really want you to read it. You need to have an idea of the settings of the story in order to see the bigger picture. Once I reached the third chapter, I could not put the book down. The book is over 450 pages long and I read it in two evenings! That is how good it is. The book takes place in two very different places as I mentioned above. Firstly you have Finn, a prisoner inside Incarceron, who has a vague impression that he may have originally lived on the Outside, but as his memory seems to have deserted him, he is unsure. He is determined to find his way out of the prison which has been sealed for centuries. Only one person has ever managed to escape before. On the outside, Claudia lives in a replica world of the 17th Century. She lives in a manor house, with servants, a tutor and an absent father, who happens to be the Warden of Incarceron. Underneath the period visage, you discover that her world is run by computers, yet they are treated as they though they don't exist. All modern elements of our world are rejected and discussed in a whisper or hidden from view. Claudia's father has arranged for her to marry a Prince she abhors. Claudia knows that something is not quite right with the world that she lives in and is desperate to get inside Incarceron to find out what is really going on in there. As you begin to get sucked into the book, realisation dawns that both characters are really in prison. Although Claudia's life on the outside might appear to be more tolerable with all the finery's around her, you begin to realise how her life is so controlled by the society she lives in. You begin to wonder whether it is better to be inside Incarceron or out. Catherine Fisher has managed to build an incredible world in this book. I could not help but stand back in awe of her world building abilities. She has created a prison that is an intelligent living organism and a 17th century world that is a sham. It is amazing and believable. From the beginning, you are desperate for Finn and Claudia to find each other, yet you are totally lost in the belief that it will never happen. They both have to hurdle such difficult obstacles, that you just can't envisage an end in sight . I kept thinking they were both doomed until I reached the last couple of chapters , I just couldn't see how they would escape. The prison is extremely scary and very unpredictable. I couldn't help but imagine it as a rather large snake, that could see and feel everything. 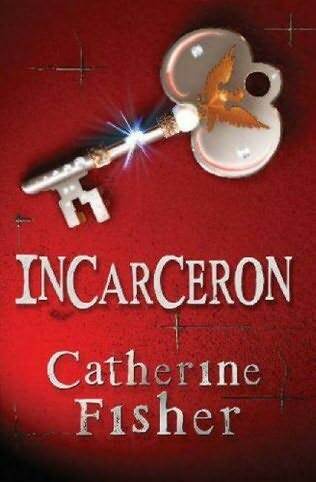 It reminded me of the intenseness of 1984, only the Incarceron prison scared me a lot more, as it seemed to absorb its inhabitants. Extremely suffocating! I was surprised to discover that this book is aimed at children. I found it to be quite indepth and felt that many younger children would struggle to understand it. I would have aimed it more at the teen market. I really enjoyed Catherine Fisher's world of weirdness and can't wait to read the follow up Sapphique. Thank you for taking part in Celebrating Wales. Viv!!!! I want to read this series soooo bad but alas cannot until April 1st (following CB's TBR Dare). A couple of my students continue to rave about this book. Also, I totally dig the UK cover. Man, most of the UK covers are preferred by me. I know many readers who have a 50/100 page rule whereby if they are not enjoying a book by this page number they will give up - awful to think you may have given up after the first few chapters and missed out on a story you obviously enjoyed. You got me totally interested, Viv! Sure sounds very good and you finished such a big book in two days! This sure does sound interesting, but I'm not totally convinced it's for me. I've heard so many great things about this book, and I loved reading your review. Thank you! 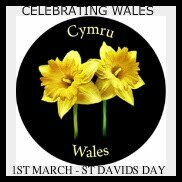 Happy St David's Day! Vivienne, this doesn't sound like a children's book to me either, but it does sound really engaging. Wonderful review! This may be the first Steampunk book I read. Wow, this sounds good. I need to read this genre. I may have to add this one to my TBR. Asamum - Steampunk! Really! I had no idea. Thanks for letting me take part. Christina - so long to wait. I may have to wind you up a little about that! Petty Witter - you just have to give this book a chance. Alice - I never usually read that fast. So believe me when I say it is good. Bermudaonion - steam punk isn't for everyone. Luisa - you will love it. Blodeuedd - you should definitely have taken part. LOL. Suko - I am still reeling from the fact it is steam punk. I really didn't realise. Steampunk and written by a lovely Welsh lady - would could be better!